When it comes to ad campaigns, I’m often a bit skeptical, especially about the messages that most advertisements spread these days. But recently I came across one very unique ad campaign that really touched me and made me think about my own behavior. “Liking isn’t helping.” is the headline of a provoking ad campaign by Publicis Singapore that was created for Crisis Relief Singapore, a disaster relief organization run by volunteers. 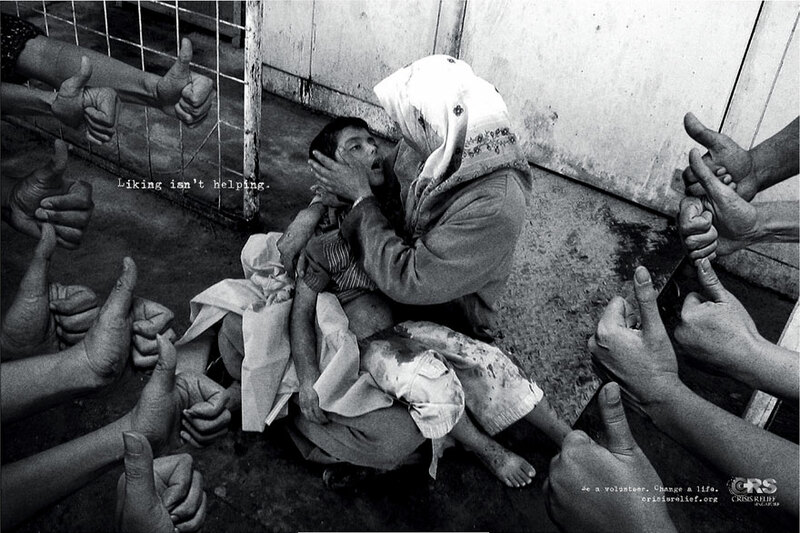 The ad campaign uses real shocking press-style images representing three types of catastrophes — floods, earthquakes, and war, which are each composed in a way that shows a suffering individual surrounded by thumb-ups, mimicking the Facebook “Like” button. What does ‘Liking’ even mean? As a frequent user of Facebook, I had to ask myself: “What does ‘liking’ even mean? What is it that I am actually communicating when I ‘like’ something on Facebook?” Well, come to think of it, that’s a good question. Do we even have any intention of taking any further action beyond hitting “like” when we see images of hungering children, war-stricken areas, or people making ends meet after a devastating flood? Does our “like” on Social media platforms like Facebook mean we like what we see, even if it’s someone else suffering? Or does it mean we sympathize with that person and by “liking” we share a token of our sympathy? Whichever the answer, the most pressing question may yet be whether “liking” actually helps? Does it do anything? Does it render any analog (real world) assistance to that anyone in need? The before may be unceasing and discomforting questions to many of us who live in denial of our own social shortcomings. But could there be any better time and period of history to be asking ourselves these questions than now? What does a “like” on Facebook mean? Gradual desensitization by social media? I am by no means saying that social media is bad; I am just reflecting on my own position to it. How do I use it and how has it made me feel about society’s state compared to the past? In psychology, desensitization is a treatment or process that diminishes emotional responsiveness to a negative, aversive or positive stimulus after being repeatedly exposed to it. Is desensitization happening to us when we watch the news every day, or when we see pictures on social media, that a decade ago might have made some of us shed a tear, but now tickle no less than a “thumbs-up” on Facebook? There is a research article on the role media plays on viewers’ desensitization related to terrorist attacks. While “media provides services to the viewers who are trying to understand the world,” it also has “adverse impacts on people.” The associated researchers investigated how breaking news regarding terrorist acts affected the viewer’s attitude over time. In their hypothesis, the researchers stated that well-educated viewers experienced less attitude change than less educated viewers and that the effect on teenage viewers was greater than the one on senior citizens. Could we apply the same logic and rationale to analyze the role of social media and how extended exposure to “graphic” imagery on it may change users’ behavior, and how these breaking news images of war and natural disasters could change the user’s attitudes or desensitize them? “Liking isn’t helping” sends out a strong message. I, for my part, realized that I need to question my inner motivation more often and reflect on how I interact with my surroundings through social media. In the end, if I don’t get up and lend a real hand, who will? That’s what I personally believe “Liking isn’t helping” is trying to say. Should You Buy New or Used Construction Equipment?